Moneta Porcupine Mines Inc. (TSX:ME) (OTC:MPUCF) (XETRA:MOP) is pleased to announce the results from the last seven diamond drill holes completed on the South West Deposit located within the Company’s Golden Highway Project (located 110 km east of Timmins, Ontario, see Figure 1). The latest assay results are from the final seven new drill holes and one drill hole extension totalling 5,409.60 m of drilling at South West. The drill program at South West forms part of the previously announced exploration drill program undertaken by the Company in late 2017 and early 2018 that was expanded to 39,300 m in 66 drill holes. Assays for the remaining drill holes from the “55” area are pending and will be released as they become available. Drilling to date at South West has been successful in confirming the existence of seventeen (17) vein structures and nine mineralized shoots. Additional veins and stockwork zones have been intersected and are being modelled. The stacked veins trend NW and dip steeply to the SW at ~70° and occur south of a Banded Iron Formation (“BIF”) within Timiskaming age clastic sediments. The first six modelled veins have an average width of approximately 2.90 m and are spaced 25 m to 30 m apart. The vein structures can now be traced for up to 500 m in strike length and have been historically drilled to depths of up to 1,200 m.
The sheared contact with the BIF hosts mineralized stockwork zones (“shoots”) which plunge ~65° to ~75° to the west and occur up to 50 m long, 25 m wide and have been confirmed to depths of over 1,000 m. A total of nine (9) shoots have been identified to date. The mineralized veins and stock-work veining within the shoots occur as quartz-pyrite veins within an ankerite-sericite-silica-pyrite alteration halo. Late carbonate-chlorite veins also occur. The nine mineralized shoots and seventeen vein corridors have now been successfully traced along a width of 1,200 m.
Drill hole MGH18-094 confirmed the down-plunge extensions of the SW-1 mineralized shoot by 100 m. The drill hole intersected a quartz-pyrite stock work on the BIF contact and returned 13.00 m @ 1.62 g/t Au at 715.00 m, including 7.00 m @ 2.05 g/t Au, including 1.00m @ 4.58 g/t Au. The hole intersected another zone within SW-1 containing 3.78 m @ 2.42 g/t Au at 740.00 m hole depth. The hole also intersected the previously released New West #1 vein in hole MGH18-093, assaying 3.50 m @ 2.11 g/t Au. Diamond drill hole MGH18-095 was drilled to confirm the occurrence of the BIF and the northern extensions of the Maple Vein set. The drill hole intersected 1.30 m @ 4.92 g/t Au from the Maple Vein extending the vein by 50m to the north and a new vein at depth east of the Maple vein assaying 0.30 m @ 18.60 g/t Au. The continuity of the new vein is to be confirmed. Drill hole MGH18-096 was drilled to test the occurrence of stockwork zones along the folded BIF and the northern extensions of the Maple and Willow Vein sets. The drill hole confirmed the edge of the SW-3a stockwork zone assaying 3.00 m @ 2.03 g/t Au and the Walnut vein assaying 0.96 m @ 12.80 g/t Au. Drill hole MGH18-097 was drilled to test the northern and southern BIF contacts adjacent to the SW-3 mineralized shoots as well as the northern and depth extensions of the Willow Vein set. The drill hole intersected the Willow vein at 614.30 m assaying 1.20 m @ 2.78 g/t Au and the Arbutus vein at 763.40 m returning 2.30 m @ 3.68 g/t Au extending the veins by 50 m to the north and 50 m to depth. Diamond drill hole MGH18-098 was also drilled to test the northern and southern BIF contacts including the SW-3d mineralized stockwork and the northern extensions of the Willow Vein set. The hole intersected SW-3d returning 25.00 m @ 2.48 g/t Au including 4.50 m @ 5.00 g/t Au, including 0.50 m @ 15.35 g/t Au and 9.00 m @ 2.42 g/t Au including 2.49 m @ 4.33 g/t Au at 453.00 m. The drill hole intersected the extensions of the Arbutus vein assaying 1.18 m @ 6.67 g/t Au including 0.78 m @ 9.12 g/t Au at 570.80 m and the Larch Vein at 720.00 m returning 4.40 m @ 2.59 g/t Au including 1.78 m @ 4.55 g/t Au. The hole extended the veins 50 m to the north and by 100 m to depth. Drill hole MGH18-099 was drilled to test the southern extensions of the SW-3a shoot and the down dip extensions of the Maple and Willow vein sets, intersecting the Walnut vein assaying 0.58 m @ 4.68 g/t Au and the Willow vein with 3.54 m @ 1.44 g/t Au. Holes MGH18-100 and MGH17-069x were designed to test the extensions of the SW-5 mineralized shoot. MGH17-069x was drilled as an extension of hole MGH17-069, which assayed 2.61 m @ 6.35 g/t Au, including 1.00 m @ 12.15 g/t Au. MGH18-100 tested the up-dip extensions of MGH17-069 but deviated east of the BIF contact zone. 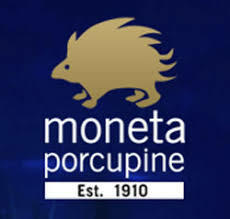 All core drilling conducted by Moneta is oriented. Drill core is sawn and half is sent ALS Canada Inc. for drying and crushing to -2 mm, with a 1.00 kg split pulverized to -75 µm (200#). A 50 g charge is Fire Assayed and analyzed using a AAS finish for Gold. Samples above 10.00 g/t Au are analyzed by Fire Assay with a gravimetric finish and selected samples with visible gold or high-grade mineralization are assayed by Metallic Screen Fire Assay on a 1.00 kg sample. Moneta inserts independent certified reference material and blanks with the samples and assays routine pulp repeats and coarse reject sample duplicates with the samples, as well as completing third-party check assays at Activation Laboratories Ltd. Gary O’Connor, FAusIMM is a qualified person under NI 43-101 and has reviewed and approved the contents of this press release.